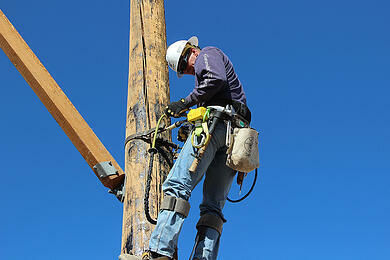 Of the 775 construction workers who died in 2012, 269 died from a fall, according to OSHA. That’s why OSHA is partnering with safety groups across the country to host a national Safety Stand-Down June 2-6. Employers are encouraged to host “toolbox talks” educating workers on the importance of using fall protection equipment and safe methods for climbing or using scaffolds. The goal is to reach at least half a million workers, or about 1 in 10 construction workers across the country. No matter your industry, hosting periodic stand-downs like this one can be an effective way to involve workers in their own safety. By taking time to reflect on fall hazards and reiterate expectations, your company shows it cares and takes the safety of all workers seriously. Here are three other ways you can prevent falls at the job site. Conducting a thorough Job Safety Analysis of all tasks that involve working at heights will help your team identify potential hazards at the job site, including faulty equipment. Your JSAs should be living, action-oriented documents. Filling them out and tucking them away in a binder defeats their purpose. A safety management software that integrates JSAs with action items, such as alerting a supervisor of the need to replace an unsafe ladder, will make them more effective in preventing falls. Always provide workers with the equipment they need to do their job safely. If the job involves working on a roof, consider whether workers need personal fall arrest systems and have a harness available for each worker who needs to tie off to the anchor. Make sure each harness fits and is inspected regularly. With the right safety management software, you can create a module to manage equipment inspections, too. Fall prevention training should be part of the orientation process for every employee who is working at a height of 6 feet or more, but one session is never enough. Work with your supervisors to schedule periodic “toolbox talks,” or informal sessions about topics such as ladder safety and scaffolding safety. This may include best practices for climbing a ladder using the “hand-hand-foot” method to maintain three points of contact at all times. Storing your safety training records in a digital format makes them easier to manage. It allows you to keep track of all sessions, whether formal or informal, and schedule reminders when it’s time to talk about fall prevention again. OSHA has a variety of training resources available, including posters and online tools. Of course, the end goal is to avoid writing any incident reports that involve an injury, but don’t wait until something serious happens to take note. Your workers should be required to report any unsafe conditions and near-misses so you can use this information to take action. When a near-miss occurs, use it as an opportunity to educate supervisors and workers about what should have been done differently to prevent it. Record all injury incident reports, near-misses and corrective action in a safety management system so you can regularly review them, noting your site’s progress over time. BasicSafe’s integrated safety software allows safety managers to maintain all crucial fall prevention tools, including JSAs, equipment audits, training records and incident reports, in one place.